When October arrives, many riders put the bike on the battery charger and cover it up until the warmer weather returns again in the spring. Above: The extent of these tar snakes makes you wonder if a chip seal would not have been a better solution? There are two factors at play here: water and weather extremes. Once water gets in the ground, it's prone to expanding if temps drop below freezing. And there are places, such as Washington's Mt. St. Helens, Oregon's McKenzie Pass and Idaho's Bitterroot Range, where it's inevitable that every year freezing will occur. Roads in these areas will be closed once the snow arrives and won't reopen until they thaw in the spring, or, during a heavy snow year, sometimes not until summer. In the meantime things are happening. If a crack in the pavement was not sealed the previous summer, water will enter into the ground and soak the soil just below the pavement. Once the ground freezes, the water will expand and several things can occur. For starters, the pushing up of the earth forces the pavement to crack even more which means there will be a larger, longer crack there the next time you ride your motorcycle over said surface. If not mended, it will eventually become a pothole. Constant freezing and thawing back and forth will play havoc on the tarmac, almost always causing sections of the road to eventually drop below the intended elevation, creating what is known as a frost heave. Forest Service 25 around Mt. St. Helens is particularly famous for its frost heaves, especially in the northbound direction along its entire length from Pine Creek Visitors Center all the way to Randle. Frost heaves don't only occur just under the road surface. They can occur anywhere there's earth that water can penetrate. Thus a hillside near the roadway may be harboring several frost heaves, but you can't actually see them. At some point, the earth may decide it's time to crumble and a few rocks may come down on the road, or perhaps the entire hillside will come down. Think about this past winter. Have there been numerous freezing and thawing occurrences in the region? If so, you can anticipate running into road crews fixing roads as you ride this coming spring and summer. And you can anticipate that there will be sections of roads that will not, or have not yet, been repaired. Which is another reason to keep your eyes up and speed down as you enter into corners you haven't yet ridden this year. 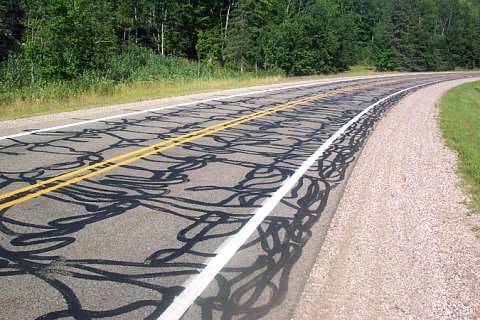 One simple solution to minimizing cracks and frost heaves is for road crews to seal the ones that are there each summer. Sealing those means using a process called tacking which creates tar snakes. Proper protocol is to clean the surface where the application will be made and have the tar well heated so when it's applied it binds with the tarmac. Only one problem - crews don't always clean the surface well enough to cause full adhesion. It's rare, but it does happen that a rider will place his wheel onto and in the direction of a tar snake and the repair will actually pull up from the pavement wrapping itself around the tire. Avoid this by positioning your wheel away from constant contact with a tar snake. The other issue here is that tar snakes can get mighty slippery on a warm day. If the temps are up over 90 degrees, a rider would do well to take turns a little slower, like one would do in the rain. Beyond road surfaces, water and temperature come into play in another way. A wet winter means plenty of moisture in the ground for summer. But a dry winter means fire season will be more active which can lead to road closures, altering your plans almost daily on a multi-day ride through the Northwest. Hope for the best and be ready for the worst. As a tour operator, I tend to keep an eye on fire activity throughout the journey and there have been nights when I have re-written GPS files so riders will still have a nice ride without bumping into fire crews and closed roads. You can do the same by checking the road conditions where you're heading the next day. And if someone in town tells you a road is closed, get it verified by going online or contacting local government. Someone might be telling you about a road that was closed a week ago, but it's actually open today. On tertiary back roads that are closed in the winter, if there's been wind in the area, one can commonly come upon blown-down trees and sometimes these may be blocking the road. It's up to you to navigate your way around them, or come up with route B. Either way, it's a good courtesy to others to contact the local government and advise them of the blockage so the next riders and motorists might get through a little better. On a GPS, you can create a waypoint of the obstruction and feed that info to the authority over the phone or via email. The Pacific Northwest is an awesome place to ride a motorcycle. A little extra care will ensure better times ahead for you and your posse. Seattle - Most dangerous streets to ride on in the Northwest?